Hello My Awesome Readers and Friends! The Night Owl Romance Love Is In The Air reader event is here! Ready to Win? 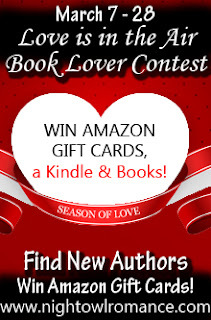 I’ve teamed up with Night Owl Romance and other authors to bring you the chance to win a Kindle, Amazon cards and eBooks. During this event I'm going to help you find some great new books. Make sure to check out my novel Breakwater Beach along the way. The grand prize is a Kindle Fire and eBook Bundle. I wish you much luck in winning.